A flat rate of R 100 is charged for courier deliveries nationwide, on orders of more than R500 orders will be free. Delivery can take 2 – 4 working days from date of despatch (please note: this is the date that your order is dispatched to you from our offices and not the date from which your order is placed), if stock is sold out or no longer available from suppliers we will contact you for new delivery dates or cancellation of order. When you click to make a purchase with us legal obligations arise and your right to refund of monies paid in any other way agreed by us, are limited by our terms & conditions. You must not make any purchase through this site unless you understand and agree to all our terms and conditions. Once payment is made for the purchase, it is deemed that you have read and understood the terms and conditions for such purchase. Once payment has been made you may cancel the order subject to our terms and conditions. If you have any queries please contact us before making any purchase for any service through this website. We are not responsible for delayed deliveries caused by any problems which may arise due to the importation of goods. This includes, but is not limited to, suppliers delaying orders, customs detaining shipments, acts of God, SARS inspections, customs inspections, Port Health inspections or flight delays. This means that if an order is delayed, the customer is not entitled to a refund. Delivery estimates are only estimates. Refunds will be made at the discretion of the company. After 45 working days from payment date refunds will be considered. Please do not purchase if you do not agree to these conditions. 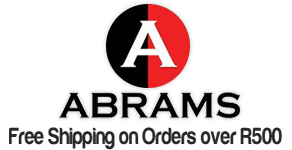 Further to this, if delivery is made and you are not available at the address and/or your phone number is not working – resulting in the shipment been returned to ABRAMSTORES – the customer will be liable for shipping costs due to non-delivery.